In 1997, a group of folks first got together in a living room in North Portland and talked about what it would be like to have a shared housing situation where everyone had his or her own space but access to common outdoor and indoor spaces and amenities. We wanted the best of co-housing—fun, community, low-impact living, and shared resources—combined with the advantages of privacy and individual homeownership. Eli Spevak and Jim Labbe never let go of the idea, and in December 2002 they purchased Peninsula Park Commons, a seven-unit apartment building located in the heart of the Piedmont Neighborhood at 6325 N. Albina. In the summer of 2004 the property was converted to condominiums, and units were sold to individuals, couples, and families. 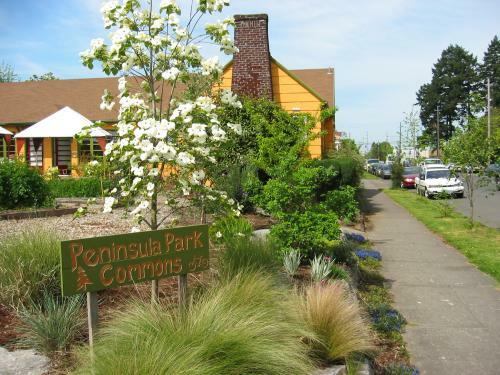 Peninsula Park Commons is founded on the belief that the health and enrichment of individuals, communities, and the places in which they exist are inextricably linked. In being a part of the Commons, we are striving to establish a cooperatively governed community where a diverse group of people will share physical and social space, and where the development, decision-making, and day-to-day operations of the community reflect our core shared values.